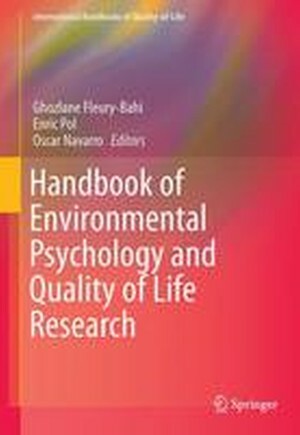 This Handbook presents a broad overview of the current research carried out in environmental psychology which puts into perspective quality of life and relationships with living spaces, and shows how this original analytical framework can be used to understand different environmental and societal issues. Adopting an original approach, this Handbook focuses on the links with other specialties in psychology, especially social and health psychology, together with other disciplines such as geography, architecture, sociology, anthropology, urbanism and engineering. Faced with the problems of society which involve the quality of life of individuals and communities, it is fundamental to consider the relationships an individual has with his different living spaces. This issue of the links between quality of life and environment is becoming increasingly significant with, at a local level, problems resulting from different types of annoyances, such as pollution and noise, while, at a global level, there is the central question of climate change with its harmful consequences for humans and the planet. How can the impact on well-being of environmental nuisances and threats (for example, natural risks, pollution, and noise) be reduced? How can the quality of life within daily living spaces (home, cities, work environments) be improved? Why is it important to understand the psychological issues of our relationship with the global environment (climatic warming, ecological behaviours)? This Handbook is intended not only for students of various disciplines (geography, architecture, psychology, town planning, etc.) but also for social decision-makers and players who will find in it both theoretical and methodological perspectives, so that psychological and environmental dimensions can be better taken into account in their working practices. Chapter 1. Introduction: Environmental Psychology and Quality of Life; Ghozlane Fleury-Bahi, Enric Pol and Oscar Navarro.- Part I. People-Environment Relations and Quality of Life.- Environmental Quality and Well-Being.- Chapter 2. Quality of Life Quality of life and Sustainability: The End of Quality at Any Price; Enric Pol, Angela Castrechini and Giuseppe Carrus.- Chapter 3. Some cues for a Positive Environmental Psychology Agenda; Sergi Valera and Tomeu Vidal.- Chapter 4. Linking People-Environment Research and Design. What is Missing? ; Carole Despres and Denise Piche.- Chapter 5. Place Attachment, Sense of Belonging and the Micro-Politics of Place Satisfaction; Andres Di Masso, John Dixon and Bernardo Hernandez.- Chapter 6. Self, Nature and Well-Being: Sense of Connectedness and Environmental Identity for Quality of Life; Pablo Olivos and Susan Clayton.- Chapter 7. Restorative Environments and Health; Silvia Collado, Henk Staats, Jose Antonio Corraliza and Terry Hartig.- Chapter 8. Green Exercise, Health and Well-Being; Ana Loureiro and Susana Veloso.- Chapter 9. Sustainable Behavior and Quality of Life; Cesar Tapia-Fonllem, Victor Corral-Verdugo and Blanca Fraijo-Sing.- Chapter 10.Self-Determined, Enduring, Ecologically Sustainable Ways of Life: Attitude as a Measure of Individuals' Intrinsic Motivation; Florian G. Kaizer, Alexandra Kibbe and Oliver Arnold.- Chapter 11. Commitment and Pro-Environmental Behaviors: Favoring Positive Human-Environment Interactions to Improve Quality of Life; Christophe Demarque and Fabien Girandola.- Chapter 12. Pro-Environmentalism, Identity Dynamics and Environmental Quality of Life; Marie-Line Felonneau and Elsa Causse.- Chapter 13. Can engagement in Environmentally-Friendly Behavior Increase Well-Being? ; Leonie Venhoeven, Linda Steg and Jan Willem Bolderdijk.- Part II. Well-Being and Daily Environments.- Chapter 14. Urban design and Quality of Life; Ombretta Romice, Kevin Thwaites, Sergio Porta, Mark Greaves, Gordon Barbour and Paola Pasino.- Chapter 15. The City as an Environment for Urban Experiences and the Learning of Cultural Practices; Pablo Paramo.- Chapter 16. Adjustment to Geographical Space and Psychological Well-being; Thierry Ramadier.- Chapter 17. Residential Satisfaction and Quality of Life; Juan Ignacio Aragones, Maria Amerigo and Raquel Perez Lopez.- Chapter 18. Spatial Inequalities, Geographically-Based Discrimination and Environmental Quality of Life; Ghozlane Fleury-Bahi and Andre Ndobo.- Chapter 19. Children in Cities: The Delicate Issue of Well-Being and Quality of Urban Life; Sandrine Depeau.- Chapter 20. Everyday Environments and Quality of Life: Positive School and Neighborhood Environments Influence the Health and Well-Being of Adolescents; Taciano L. Milfont and Simon J. Denny.- Chapter 21. The Effect of Workplace Design on Quality of Life at Work; Jacqueline C. Vischer and Mariam Wifi.- Chapter 22. Comfort at Work: An Indicator of Quality of Life at Work; Liliane Rioux.- Chapter 23. Quality of the Hospital Experience: Impact of the Physical Environment; Ann Sloan Devlin and Claudia Campos Andrade.- Chapter 24. Healthy Residential Environments for the Elderly; Ferdinando Fornara and Sara Manca.- Part III. Quality of Life and Environmental Threats.- Chapter 25. Environmental Stress; Birgitta Gatersleben and Isabelle Griffin.- Chapter 26. Living in An "At Risk" Environment: The Example of "Costal Risks"; Elisabeth Michel-Guillou and Catherine Meur-Ferec.- Chapter 27. Social Inequality and Environmental Risk Perception; Oscar Navarro.- Chapter 28. Living in Industrial Areas: Social Impacts, Adaptation and Mitigation; Maria Luisa Lima and Sibila Marques.- Chapter 29. Emergent Risks and Quality of Life: Towards New Dimensions of Well-Being? ; Dorothee Marchand, Karine Weiss and Bouchra Zouhri.- Chapter 30. Energy Issues: Psychological Aspects; Rafaella Lenoir Improta, Patrick Devine-Wright, Jose Q. Pinheiro and Petra Schweizer-Ries.- Chapter 31. Global Challenges for Environmental Psychology: The Place of Labor and Production; David Uzzell, Nora Rathzel, Ricardo Garcia-Mira and Adina Dumitru.